"Murph" first fell in love with bluegrass music while living in Chicago and immediately started studying it with the great Czech guitar player Slavek Hanzlik as well as Don Stiernberg and Greg Cahill. After living in Chicago he moved to Colorado and founded the band Slipstream which performed at many notable festivals such as Grey Fox in New York. He then toured the country performing with Nashville singer/songwriter Rorey Carroll and has performed with such bluegrass luminaries as Noam Pikelny, Matt Flinner, the Infamous Stringdusters, Crooked Still, Darol Anger as well as many others and has been an endorsed artist for Elixir Guitar Strings for 14 years. Currently Murph is living in Shanghai, China, performing with mandolin virtuoso Tom Peng and teaching guitar lessons while exploring as much of Asia as possible. Chris Thile, winner of the MacArthur Genius Grant, says this about Brad Murphey "a great lead guitarist..... and awesome rhythm player too!" Hailing from both Michigan and West Virginia, Leslie has been studying the upright bass since she was just a little girl. As she got older she decided to further her music education at Western Michigan University where she focused on Music Education. While in college, Leslie also toured the midwest with the many orchestras and string ensembles she represented. Outside the classroom, Leslie immersed herself in Kalamazoo's local music scene where she discovered her deep love for Bluegrass and folk music. It didn't take long before she was singing and playing in numerous bands such as The Mossy Mountain Band and Who Hit John? With string music tugging at her heart, Leslie decided to move to the mountains where there was sure to be no shortage of good pickers. Since the summer of 2009 when she moved to town, Leslie has played with some of the Colorado's most talented acts including Spring Creek Bluegrass Band, Bonnie and the Clydes, and was a founding member of The Railsplitters. Leslie is currently teaching elementary music in Shanghai, China, where she nurtures and encourages the future generation of music lovers. Ke Kukui Foundation along with hula school, Kaleinani O Ke Kukui -- both founded by the late Deva Yamashiro or “Aunty Deva” -- has continued to build and strengthen Hawaiian and Polynesian communities in the Pacific Northwest for the past 20 years. The organization's efforts to raise cultural awareness and spread the aloha spirit has made a lasting impact on families in the community. From the keiki (children) to the kupuna (elders), Ke Kukui Foundation and Kaleinani O Ke Kukui have created a home for those who hold Hawai’i close to their heart and welcome those who are eager to learn the culture of the islands. Ke Kukui Foundation is excited to be participating in the Cordova 4H Music Camp for their 5th year. They will be leading a Hawaiian Camp for the keiki (6-8 yrs), teaching ukulele, and also adding to this year’s list – hula & Tahitian dance classes. Kaloku Holt, eldest son of “Aunty Deva,” now the Executive Director of Ke Kukui Foundation and also lead hula and music instructor at Kaleinani O Ke Kukui. This will be Kaloku’s 3rd year at the Cordova 4H Music Camp. Alyssa Reyes, fiancé of Kaloku, is a polished professional performer recently moved from Hawaii. She excels in various styles of Polynesian dances and also teaches at Kaleinani O Ke Kukui. This will be her 1 st time at the Cordova camp. Aloha, my name is Kilinahe Agres. I was born and raised on the island of O’ahu, and currently live in Ewa Beach, Hawaii. I had the privilege of attending Kamehameha Schools, a school for children of native Hawaiian decent. My love for Polynesian dancing started at a very young age, and I was fortunate enough to start dancing professionally at the age of 16. I’m currently one of the lead dancers at one of O’ahu’s best luau’s, Paradise Cove Luau. Dancing has given me the opportunity to travel the world, and I’m so excited it has brought me here to share my culture with all of you! Keawe Holt, youngest son of “Aunty Deva” led Keiki Camp last year and is a highly skilled ukulele and hula dancer. This will be his 2nd year participating at camp. Ka’imi , a student of Kaleinani O Ke Kukui, will be joining the team and helping with Keiki Camp and sharing his love for his home Hawai’I and his aloha to all. This will be his 1st year participating at the 4H program. Zacahry is a military vet who was born and raised in Kaneohe, Hawaii. He has been dancing for over twenty years, and he’s competed at the highest levels of hula and Tahitian dance. Zachary currently performs at the world famous Paradise Cove Luau. He’s excited to be coming to Cordova as a Hawaiian Camp instructor, and he says that visiting Alaska is a “bucket list item” for him. Mahealani is a hula dancer that has been with Aunty Deva and Kaleinani O Ke Kukui since the age of 3yrs old will be joining as an assistant with the keiki camp. This will be her 2nd year teaching at camp. Brady “Oku” Holt, son of Alyssa &amp; Kaloku and grandson of “Aunty Deva,” this 1yr old will be helping his mommy at camp and will be focusing on lighting up the faces of all he encounters with the joy of the aloha spirit just like his tutu (grandmother) would do. This will be his 1st time in Alaska. Sean has a uinque palate for music and production. He attributes a great deal of this to his time spent at multiple universities. He obtained a Music Technology Technical Certificate in a year at Nashville State Community College and oversaw live sound for the East Tennessee State vocal group, Greyscale. Sean Anderson has a B.A. in Commercial Music Performance with a focus in voice from Trevecca Nazarene University in Nashville, TN. He has also studied songwriting, guitar, and music technology. A native to Nashville, Sean has been involved in choirs and ensembles for the entirety of his schooling. He has also facilitated worship at a local church as an interim worship leader. Sean is a true bass singer, so he has had the opportunity to perform solos in Trevecca's Commercial Vocal Ensemble, University Singers, and many featured events. Kate grew up in Anchorage, Alaska listening to her parents and friends play bluegrass, old time, and folk music. At the age of 14, she joined Bearfoot, a nationally touring band, and played festivals such as Merlefest, Greyfox, Wintergrass, Rockygrass, and Telluride to name a few. As a Compass recording artist, Bearfoot cut their 4th album, called "Doors and Windows" in April 2009, which quickly rose to #1 in the Billboard Bluegrass Charts. Kate is also the director of the renowned bluegrass music education program, "Bluegrass Camps for Kids", which has taught thousands of children internationally in the last decade. Kate has a B.S. in Elementary Education through the University of Idaho, and recently obtained a M.Ed. in Language and Literacy at San Francisco State University. Fred started playing guitar at age 16 and bass a few years later. By 1966, he was playing electric bass in a rock and roll band. 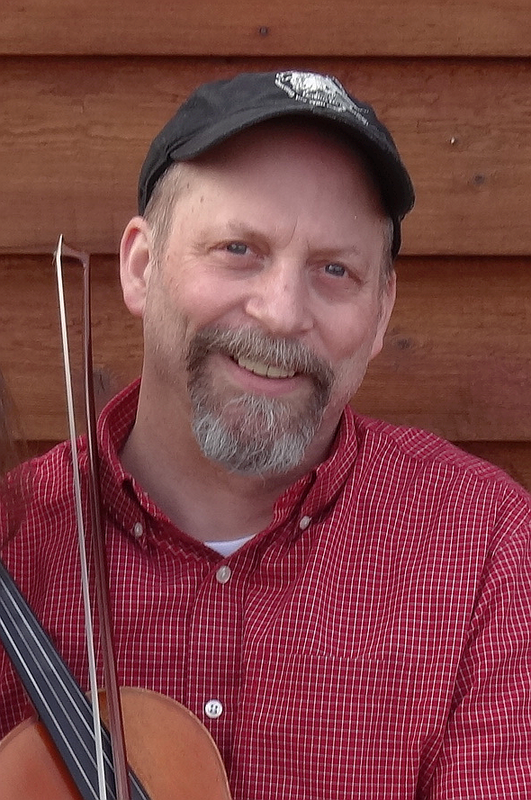 He now plays both electric and stand-up bass in a variety of Fairbanks bluegrass, country, and Americana bands. He also plays guitar and sings lead and harmony—and is a talented songwriter. One of his bands, the Denali Mountain Boys made a CD which features three of his songs. They have toured in Hawaii, Georgia, and Pennsylvania—in addition to playing many Alaskan gigs. Fred has a Masters in Teaching—and loves teaching everyone—plus learning himself! Fred studied mandolin at the Rockygrass Academy in Colorado. Fred has been on the Dancing with the Spirit staff for the past eight years--teaching guitar, bass, singing, and square dancing to kids in Alaskan villages. Scott started playing old time fiddle in 1980, hooked by revival bands such as Fuzzy Mountain, Hollow Rock, Highwoods, and Plank Road. After moving to Alaska, he spent some time in rural areas, woodshedding with cassette tapes of old 78s, Round Peak tunes, and Kentucky field recordings. He recorded with the Improbabillies in the late 1990s and played in the Ray-Jen Cajun Band for 20 years. He tutored at the Centrum Festival of American Fiddle Tunes in 2017 and is looking forward to helping fiddlers find their old-time groove. Dylan Williams started playing piano at the age of 6 and has not looked back. He began with classical music and at the age of 7 picked up the guitar and learned how to jam with others. He began as a camper at Alaska City Folk Arts Camp at the age of 8 and only missed when he was out of the country. Dylan moved to Wales in 2010, where he honed his music playing skills just outside of Snowdonia National Park. In 2013 Dylan returned to Alaska and joined the band The Vinyl Floors his sophomore year of high school and has been performing ever since. He currently goes to college at Saint Mary's College of California in the Bay Area where he is majoring in applied philosophy. Dylan began teaching in 2016 with his first private guitar student, at Folk Arts camp and in Cordova. Pete has been playing traditional American music since he was in high school in Pennsylvania. He taught himself to play the banjo from the classic, How to Play the Five String Banjo by Pete Seeger, and was influenced by the likes of Doc Watson, Norman Blake, John Hartford, Tommy Jarrell, Gid Tanner, and the Highwoods String Band. Except for an inexplicable decade-long hiatus, he has been active in the music scene in Alaska ever since he moved to Fairbanks in the 1970s, playing first with One Size Fits All, later traveling and recording a CD with Five Buck Fiddle. He wrote an article for Old Time Herald in 2009, “Old Time Music in Alaska: Then and Now”. He currently plays in several bands, including Lost Dog, whose monthly square dances in Ester Alaska have an enthusiastic following, and the eclectic bluegrass/country band, Rock Bottom Stompers. He jams at as many festivals as he is allowed in to, often with a loose pick-up band, Hog Heaven. His most recent musical venture is with the two family collaboration, Norris Bowers Band, who recently recorded Gin Chicken (“high octane old time music with a bluegrasser’s eye for drama and harmony”). His son Ryan (bass, vocals) and daughter Aurora (fiddle, vocals) continue the family musical tradition in admirable fashion. Patty came to Cordova Camp in year one, with Kate and Peter, and has taught Guitar, Upright Bass, Square Dance and Band at the 4-H Kids’ Camp. Most recently, she’s been teaching Guitar, Uke and Harmony Singing at Adult Camp, and she seeks out informal opportunities to play and sing with new and old friends. Patty teaches First/Second grade in Anchorage, and has taught at Mary Schallert’s Alaska City Folk Arts Camp many years. Patty and husband Dave played in contra dance band Anchor Steam 12 years, and will always be engaged in learning and sharing Singing and Old Time music in Alaska. Belle started playing fiddle when she was 10 years old—and has been playing in old time and bluegrass bands since 1975. She has a passion for teaching music and helped start the Cordova 4H Music Camp 25 years ago. Now she is the director of Dancing with the Spirit, a program to take the music camp idea to Alaskan villages. Color-coded guitar chords and accompanying fiddle tab are used to make music easy for beginners. Belle also teaches an extra curricular acoustic music program for the Cordova schools and calls an occasional square dance. She became an Episcopal priest 12 years ago—and loves gospel music, bluegrass jamming, singing, dancing, and fiddle tunes! Born and raised in Alaska, Annie Carlson has been playing music and singing since she was 10. Influenced by bluegrass, folk, irish, pop, country, classical music and taught by Mike Mickelson of Bearfoot Bluegrass, she began teaching and performing at Alaska Folk Festivals in 2010. 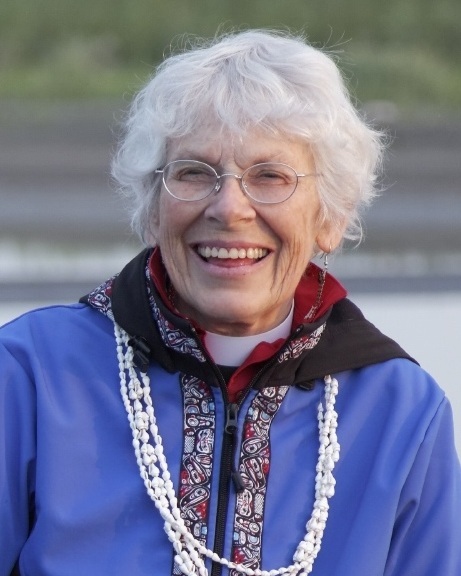 She has taught elementary students at the Morning Music program in Cordova, Alaska and at gospel and bluegrass camps in Alaska and Hawaii since 2011. She has earned first chair honors performing in state choirs, and in February 2014 won a place in the Honors Performance Series Choir, performing at Carnegie Hall in New York City. After high school, Annie pursued a major in Commercial Voice and a minor in Recording Technology at Trevecca Nazarene University in Nashville, TN. This earning her solos in Trevecca's Commercial Voice Ensemble, University Singers, and other choirs/musicals. This fall her plans include furthering her education in an intensive Recording Technology program in Ohio. and is eager to share them. Caroline has been playing fiddle since she was a wee 7 years old. Born and raised in Atlanta Georgia she played in the Atlanta Symphony Youth Orchestra. After graduating from the University of Georgia, she moved to Asheville, North Carolina and helped form Snake Oil Medicine Show, where they toured through North America, Jamaica and Europe for over a decade playing at Festivals, schools, theaters and recorded 6 albums. She now resides in Hawaii and plays with 3 different bands. 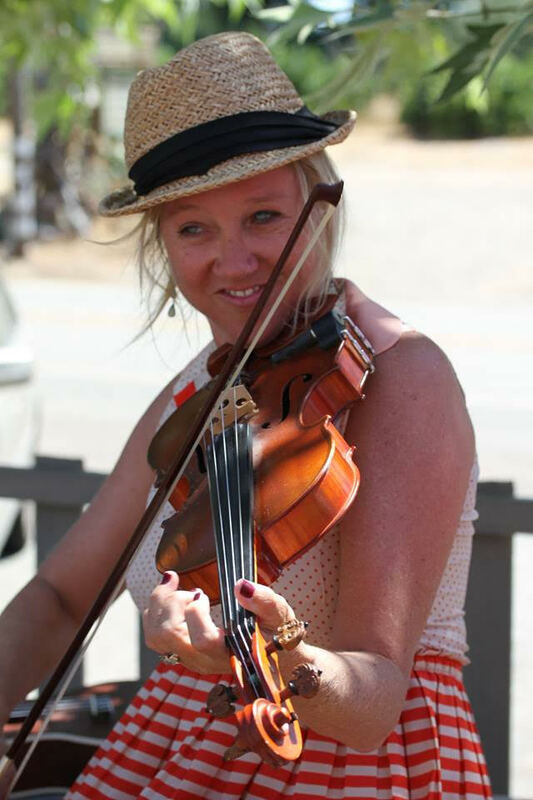 She is thrilled to bring her years of experience with teaching, playing fiddle and ukulele and her fun positive attitude in life to the camp this year. Nancy Galambush began playing the mountain dulcimer in the 1990’s when her husband, the late JC Bradshaw, asked her to learn to play an instrument he had built. Nancy has taken classes from some of the best-known dulcimer instructors in the country through Western Carolina University’s Dulcimer program. She has taught at dulcimer workshops across North Carolina, in Virginia and Georgia and in Cordova, Alaska, in addition to private students. Nancy has a special interest in the history of the mountain dulcimer and enjoys sharing that history during her concerts and through East Carolina University’s Lifelong Learning Program. Nancy also plays cello in the Pitt Community College Symphony Orchestra and lives in Snow Hill, North Carolina.